I made this simple bun xao xa thit heo (or sauteed round rice noodles in lemongrass & pork) for lunch and everyone seemed to think it was delicious. Perhaps because we were starving! I made a similar dish but with minced pork so my grandmother can eat. The lemongrass came from the clumps grown in the back of my grandmother's yard. The rest of the ingredients came from various vendors at An Trach Market. This noodle dish is flexible. You can add as many ingredients as you want. I prefer to make one or two servings at a time. It is best to eat this as soon as it is done cooking. 1) Heat a large non-stick pan or wok over medium high heat. Once the pan or wok is hot add a little oil (about 1/2 a tablespoon). 2) Add about 1 tablespoon of lemongrass, a pinch of ginger, 1 tsp of garlic, 1 tsp of shallot, a small handful of scallions, and a few onion wedges. Saute for about a minute. 3) Add a few slices of pork and saute until the meat is just cooked. 4) Add a handful of noodles and saute until the noodles are heated through and the ingredients coat them. 5) Add 3-4 tomato wedges and a little of the beansprouts. Cook for about a minute or until they are cooked to your preference. 6) Season with a few drizzle of fish sauce and a pinch of sugar (or according to your taste). Toss all the ingredients together until they are all blended..
7) This is how I serve the noodles: Line some lettuce in a plate, add the noodles on top, tear or cut some herbs and scatter them on top of the noodles, sprinkle some peanuts and garnish with a wedge of lime. I drizzle some dipping sauce right before eating. 8) Repeat the same procedure until all the ingredients are gone or you may refrigerate some of the ingredients to make another batch later. *May use beef or seafood instead of pork. Use more if you are interested. 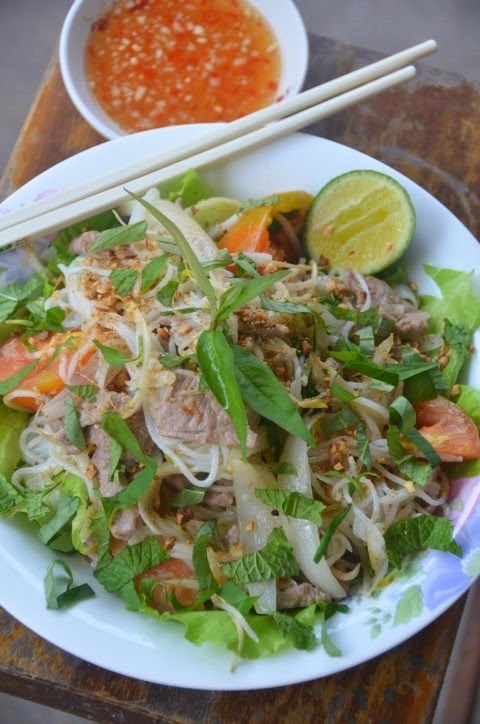 I prefer a few slices of meat and lots of herbs and vegetables in this noodle dish. *I spoke to one of my aunts (living in California) over the phone and she asked me what I have been making. I told her about this dish. She suggested that I marinade the meat. So if you are interested you can marinade (for 15 to 20 minutes) the meat with some lemongrass, ginger, garlic, shallot and a few squirts of rice wine. 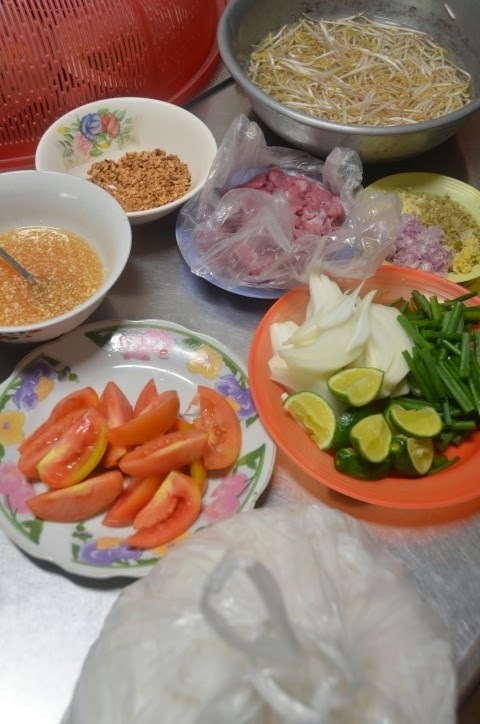 *My cousin Hui Chieu reminds me that some restaurants or vendors in Soctrang do not saute the noodles in with the rest of the ingredients. However, I prefer cooking the noodles for a more robust flavor. When you cook this dish you can choose whichever method you prefer. Also always feel free to adjust the ingredients to please your taste buds.